St Etienne fans have been banned from supporting their side at away games until the end of the year after nine people were injured on Sunday. The injuries occurred when St Etienne followers threw seats at home supporters in Nice's Allianz Arena during a Ligue 1 match on Sunday. 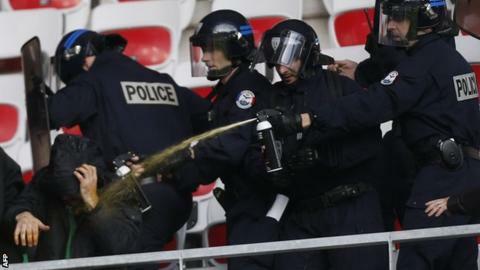 The sanction means St Etienne fans will not be allowed to attend trips to Rennes and Montpellier in Ligue 1. The ban also includes the League Cup tie with Paris St-Germain. A statement from France's Professional Football League (LFP) read: "The LFP's competitions commission has decided to close the visitors' stands during St Etienne's away games until the end of the year." The trouble started before the match as away fans dismantled seats and threw them towards opposition supporters. French newspaper L'Equipe reported 250 St Etienne fans were ejected from the stadium as a result.